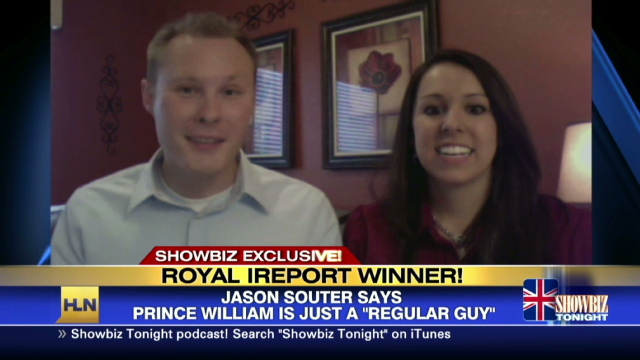 The winner of the CNN iReport Royal Wedding contest, Jason Sauter, was interviewed live via Skype yesterday on HLN’s Showbiz Tonight with Brooke Anderson. Jason Sauter and his girlfriend, Nancy Vidarte, spoke to HLN’s Brooke Anderson about their excitement about winning CNN’s Royal Wedding iReport contest; as well as how Sauter plans to share his perspective and point-of-view of the Royal Wedding. Sauter will join Brooke Anderson & CNN’s Royal Wedding hosts: Piers Morgan, Anderson Cooper, Kiran Chetry, and special contributor, Cat Deely live in London next week for the royal nuptials of Prince William and Kate Middleton.